O’SHUCKS PUB AND BILLIARDS first opened their doors on October 1st, 2003. The owners Bob, Keith and Richard all had a dream to one day own their own bar. Bob always wanted a Billiard hall, Keith always wanted an Irish Pub and Richard wanted his own sports bar, so the three of them put their heads together and combined all three ideas into one great bar! The three of them had EXTENSIVE backgrounds in customer service and they felt they knew enough people to come out and support their new venture. They wanted a fun, casual place where people could come out, listen to music, eat food and have some good drinks. Their philosophy was to treat people the way they wanted to be treated, and that is one of the reasons they are so successful today! Bob used to work with Keith at Disney back in 1991, and stayed friends ever since. When Bob left Disney full–time in 1995 he started working at the Peabody hotel where he met Richard, and worked with him for about 8 years. 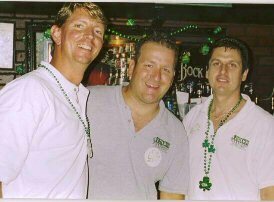 In the summer of 2003 Bob was out scouting areas for a possible bar, when he found a spot on I-Drive, he called up Keith and Richard to see if they were still interested in taking a HUGE leap, and open up their dream bar. Of course Keith and Richard didn’t even hesitate on the offer, so the three of them tried several banks looking for the startup funds, but then every bank turned them down, they decided to do the unthinkable….. they each put their houses on the line and took out home equity lines of credit to build-out the bar of their dreams. Keith was working in catering for over 15 years, Richard was at the Peabody for over 9 years and Bob was a Sales Manager at Mears Transportation in Orlando. Mears was nice enough to terminate his employment when his boss got wind he was investing in a bar, actually telling him that was a “conflict of interest” and was let go on the spot. The three of them put their equal shares of money together and starting building the bar on I-Drive. Once they were done remodeling, and ready to open, Richard left his job and started working full-time at the bar with Bob. Keith worked part-time for about one year at the bar until he made the big step of quitting Disney in 2004. Where did the name O'Shucks come from? This a question they get all the time. They story goes like this….. When it came time to think of a good “Irish” name, they realized everything was O’…something…. O’Sullivans, O’Flanagans, so out of frustration of not thinking of a good name, Bob said O’Sh--! ….Then it hit him… lets be politically correct and call it O’Shucks. The three of them emailed their friends with a bunch of different names, and the one that stuck out to everyone was O’Shucks. They added the Pub and Billiards to it and there you have it. O’Shucks is just a phrase, it has nothing to do with the food they serve. At least once a month someone comes in and asks… “Do you sell oysters?”…. Um NO! So, please don’t come in and ask such a stupid question.. Thanks! To this day, you can find at least one of the owners working behind the bar serving your drinks. Come in and say hello and if you have any comments or questions, please don’t hesitate to ask them.